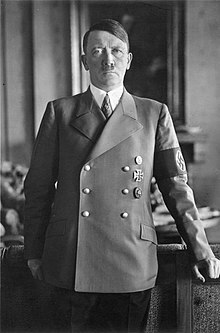 Adolf Hitler (20 Aprile 1889 - 30 Aprile 1945) wis the dictator o Nazi Germany an leader o the Nazi Pairty. Frae 1933 tae 1945 he wis Chaincellor o Germany forby, heid o govrenment, an heid o state. Hitler is an important leader in warld history. The militar-industrial complex he makkit helpit Germany git oot o the economic problems efter Warld War I. At ane time, Hitler's govrenment controlled a muckle pairt o Europe. On his order, millions o fowk wis murthert in the Holocaust. He committit suicide in Berlin afore his airmy wis defeatit. Adolf Hitler wis born on Aprile 20t 1889 at Braunau am Inn, a smaw toun naur Linz in the province o Upper Austrick, nae far frae the German mairch, in whit wis than Austrick-Hungary. Adolf wis an mensefu lad, but he failt the heich schuil admeession seys in Linz twice. Thare, he becam interestit in the anti-Semitic (anti-Jewish), Pan-German haivers o Professor Leopold Poetsch. In 1913, Hitler wis 24. At that time, aw young Austrian men haed tae jyne the airmy. Hitler didna like the Austrian airmy, sae he left Austria for Germany. He steyed in a German ceety, Munich. In 1914, Hitler jynt the German airmy. He did weel for Germany in the First Warld War. He wis hurt in the war. The govrenment gied him the Airn Ruid as an awaird for his bravery. In 1919, Hitler jynt a smaw poleetical party cried the German Warkers' Party. He belyve wun the support o the party members. Twa year efter, he becam the heid o the party. He renamed the party the Naitional Socialist Party or the Nazi Pairty. In 1923, Hitler tried to owerthraw the Weimar Republic govrenment in the Swats Haw Putsch, but coudna dae it. The govrenment pit Hitler in the Landsburg Jyle. Thay said that he wad stay in the jyle for 5 year, but thay lat him leave efter 9 month. While he wis in preeson, he wrate a beuk wi the help o his freend Rudolf Hess. At first, Hitler wantit tae cry the beuk Fower an a Hauf Year o Struissle agin Lees, glaikitry an Couardiness. In the end, he cried the beuk Mein Kampf or Ma Struissle. In the beuk, Hitler shaws respect tae his faither. He says that thay haed disagreements. Hitler wisst tae become an airtist. His faither didna like this, he socht Adolf tae wark for the govrenment insteid. In 1932, Hitler makkit the plans for a caur: later it was the weel-kent Volkswagen beetle. In 1933 Hitler gat intil pouer in Germany acause o poleetical manoeuverin. His govrenment immediately began restrictin freedom o speech an the press. It baured aw ither parties cep the Nazi party, an makkit fowk poleetical preesoners. On 29 Aprile 1945, Hitler married Eva Braun; anly ane day later they committit suicide in Berlin afore his airmy wis defeatit. ↑ NS-Archiv, 7 Aprile 1925. Wikimedia Commons haes media relatit tae Adolf Hitler. This page wis last eeditit on 7 September 2017, at 21:42.